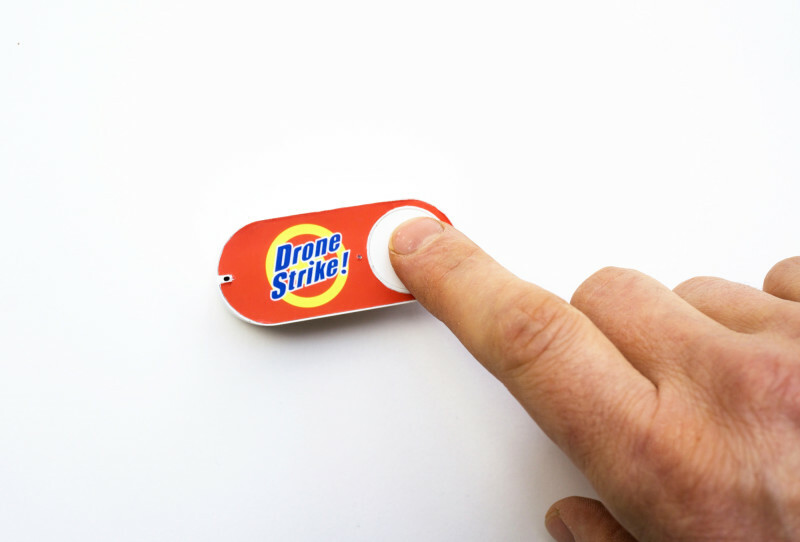 Amazon Dash is an Internet connected button to make online shopping as simple as possible. The ‚click-buy‘ interface from the website becomes a real button. For each brand series Amazon offers a different button which, when pressed will result in the delivery of a single product. „Never worry again“ [to run out of soap, shampoo or chocolate etc.] was the slogan Amazon used advertise this new invention in Spring 2016. With each button press a complicated chain of logistics and automation is triggered. A hyper optimized series of commands is issued through networks, software, robots and low wage workers to make the perfect delivery chain work. We don‘t understand in detail how all this works. Where does the product come from? Who made it? How many robots or low wage workers were involved or what is their condition? We just press a button and like magic a new consumer good appears a day later. The current worldwide drone war works in a similar way. Drone operations are highly automated and distributed among a series of specialists with different tasks. Only very few officials get the whole picture who and why someone is attacked. The drone soldier in the bunker in nevada (or else where) who presses the button to kill certainly doesn’t know. All we know is that these soon to be automated wars are taking place to ‘protect’ our ‚freedom‘ to consume, to make sure the people in the western world keep buying more and more products every day. The project started with a photoshop mockup and tweet in April 2016.